Can my car be hacked? 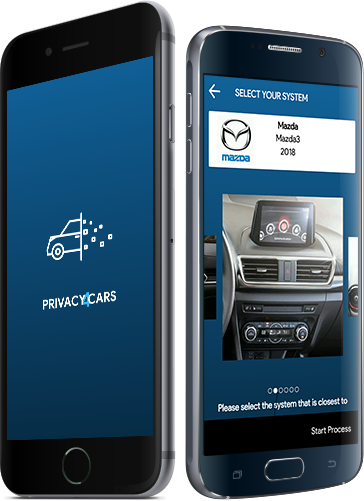 Privacy4Cars is the first and only mobile process designed to help erase Personally Identifiable Information (PII) from modern vehicles. The app is available as a free download on iOS and Android devices. It enables consumers and businesses to quickly and efficiently delete personal data retained by modern vehicle infotainment systems. why do you need PRIVACY4CARS©? Used vehicles are changing owners, with prior users’ electronic information (phone logs, navigation history, address books, garage codes, etc.) remaining in the vehicle. Resetting the vehicle’s systems to factory settings and wiping the personal data from the vehicle is a time consuming manual effort. The process varies greatly across vehicles of different makes, model, year, and trim. We have developed the largest and fastest growing database of step-by-step visual instructions and a patent-pending process that greatly streamlines and logs the deletion of Personally Identifiable Information to provide simple compliance and protection. Rapidly and reliably erases all your personal information. Help renters and subscribers who pair their phones erase their personal information upon returning the vehicle, so your personnel doesn’t have to! Generate revenue by licensing the Privacy4Cars app and reselling the wiping service to your customers. Early deletion of PII minimizes the risk of data theft. Build a compliance record and protect your customers from identity theft, fraud, and larceny. Make privacy part of your service and value proposition. 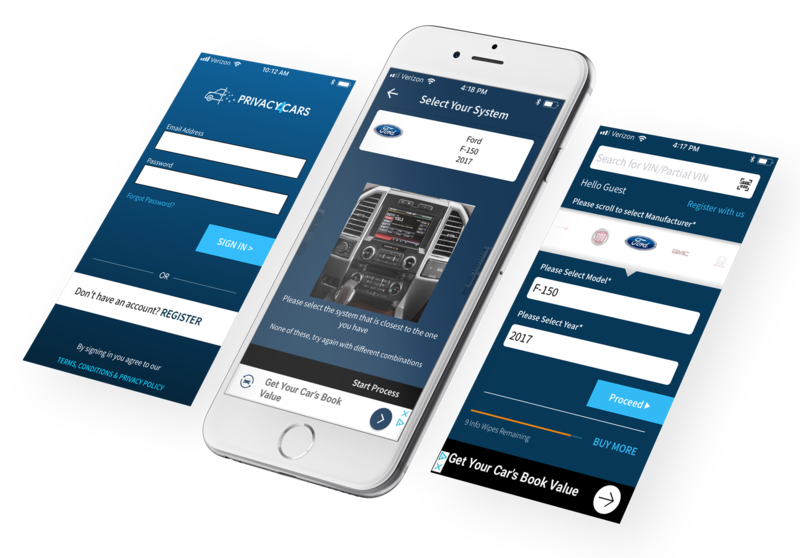 Clear user data from trades, lease-end vehicles, loaners and courtesy cars, CPOs, and wholesale units. Consider offering Privacy4Cars as a perk to your employees - especially if they have a company car. Protect their personal and your business data. The app has a nice feel and came up with the info I was looking for. I entered VIN manually, and it worked as expected. This is so easy to use, I didn’t have to spend hours searching the web! Thank you so much for a great app! Such a great application to secure my valuable data and ease my mind. Works great and very simple to use! At Privacy4Cars, we promise to treat your data with respect and will not share your information with any third party. You can unsubscribe to any of the investor alerts you are subscribed to by visiting the ‘unsubscribe’ section below. If you experience any issues with this process, please contact us for further assistance. By providing your email address below, you are providing consent to Privacy4Cars to send you the requested Investor Email Alert updates.